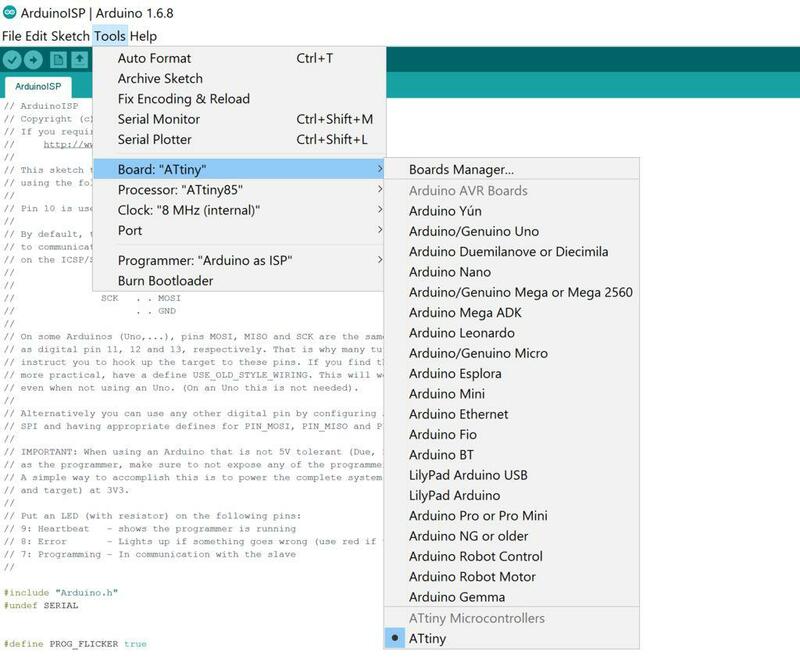 Upload Arduino Sketches to ATtiny85 With UART This article will show you how use a two-wire interface (UART) to upload Arduino sketches to the ATtiny85. In short, we will burn the TinySafeBootloader onto the ATtiny85 using an Arduino Uno as an ISP programmer. After the initial burning of the bootloader, we can then program the ATtiny85 with any FTDI compatible USB-to-UART. And very similar steps may be followed to do the same for an ATtiny84. Many may ask, “Really, why would I want to go through all this trouble to install a bootloader on an ATtiny85 when it is less trouble just to use the Arduino ISP?” Good question. This article was not meant to be independent. The entire purpose of the this is to prepare an ATtiny85 (actually, any ATtiny orATmega uCs) for wireless upload of Arduino sketches or AVR binaries. But outline the steps briefly, just in case. 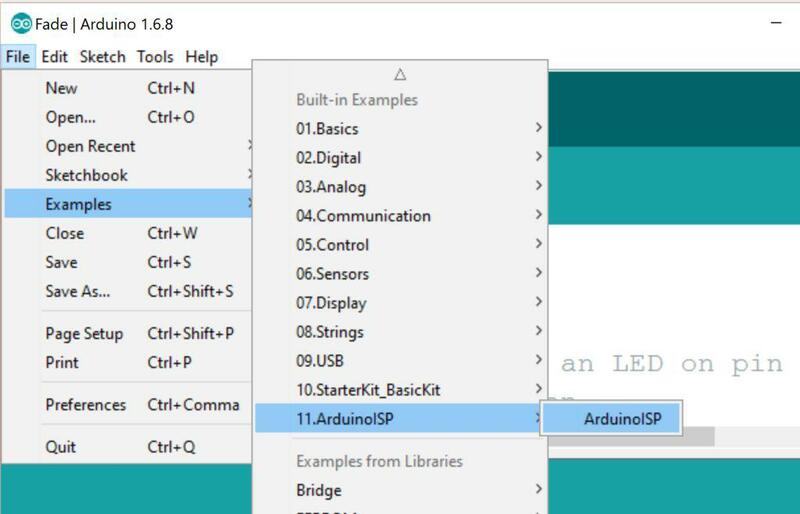 before wiring up the Arduino Uno to the ATtiny85 you will need to install the Arduino ISP sketch onto the Arduino Uno. This is built into the Arduino IDE. Then hit the Upload button. Wire up the ATtiny85 After the ArduinoISP sketch has been uploaded it is time to burn our bootloader to the ATtiny85. Go ahead and wire your ATtiny85 to the Arduino Uno as shown in the image above. 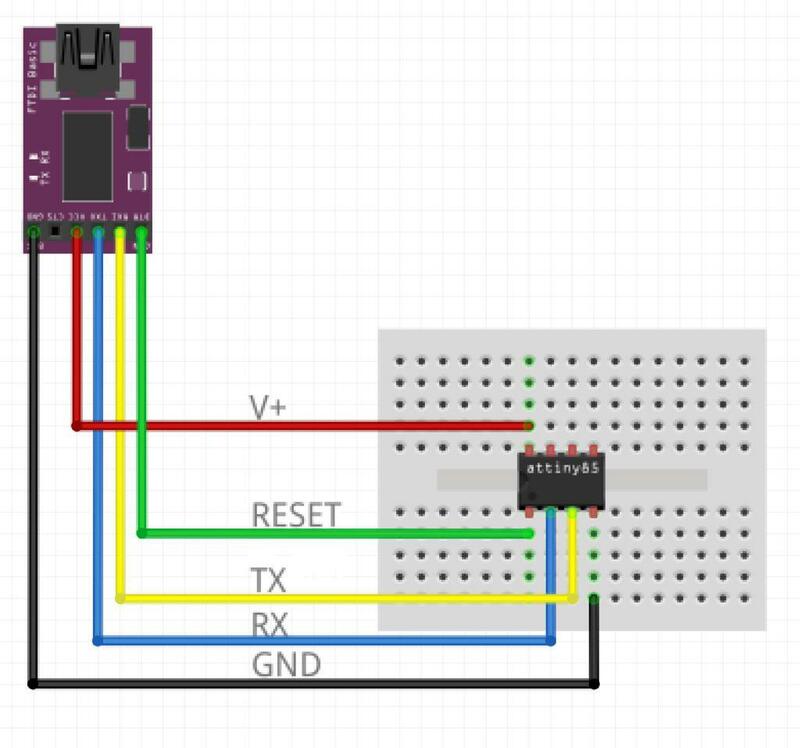 Now the ArduinoISP sketch has been uploaded it is time to burn our bootloader to the ATtiny85. Go ahead and wire your ATtiny85 to the Arduino Uno as shown in the image. And press return. You should see output similar to what’s in the image. *Please hear my warning* what we are about to do has the potential of brick your ATtiny85. More specifically, if we set the fuses wrong on the ATtiny85 it might render the chip unusable. That stated, let’s take a moment and talk through what we are doing. At this point our Arduino Uno is setup as an ISP. We plan to use AVRDUDE to tell the ISP to burn the TinySafeBootloader onto our ATtiny85. In the process we will also set the fuses on the ATtiny85. These fuses are bits of memory which tell the ATtiny85 how to act. There are two will need to set to use TinySafeBoot on any ATtiny supported. BODLEVEL – should be set to avoid flash corruption during unsafe device power-up. 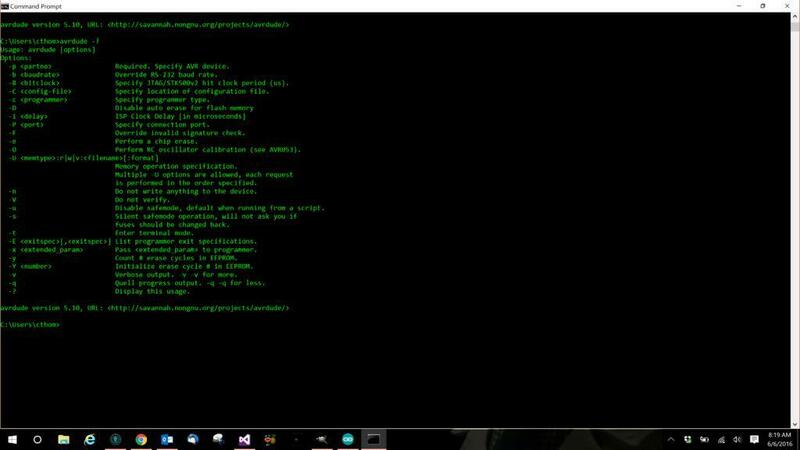 BOOTRST – activated lets the MCU jump into the Bootloader section with every hardware reset. BOOTSZ=11 – to reserve 512 bytes for a Bootloader Section. BLB – set to MODE 2 or 3 to protect Bootloader section from undesirable write access by firmware. If you don’t quite trust me or if you would like to read more about fuses, here’s a great explanation. However, I’ve provided the two commands you will need for the to program the ATtiny 84, 85, and ATmega328P. Copy the first command and paste it to the Windows prompt. 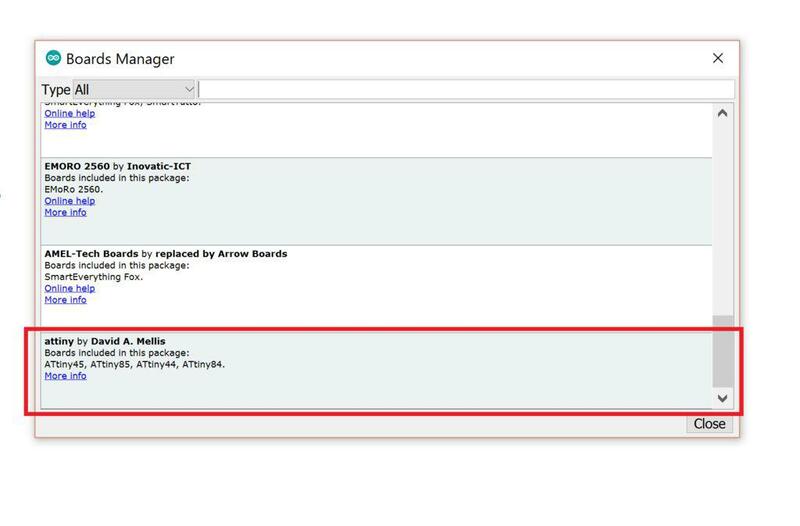 If the command is successful, copy the second command. If both commands are successful, you should now have the TSB setup on your ATtiny or ATmega chip. If you have any issues, please leave any questions in the comments below. 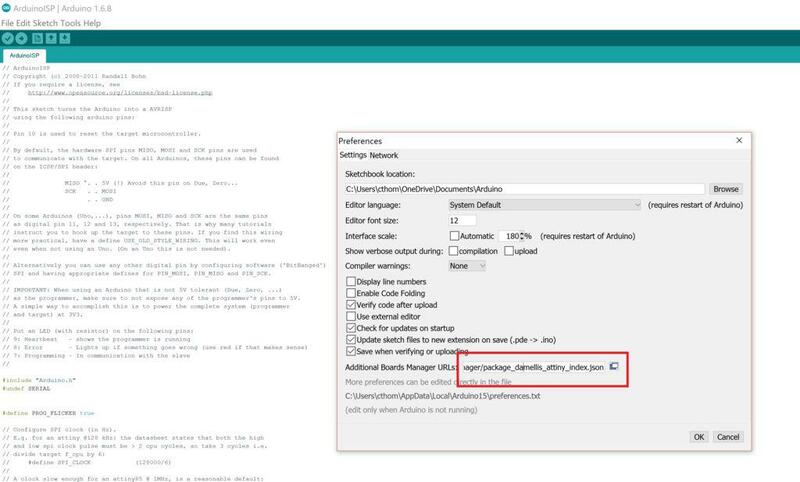 Usually, the Arduino IDE takes care of the upload, however, it doesn’t know how to interface with the TinySafeBootloader. This is where the Lumi Uploader comes in. 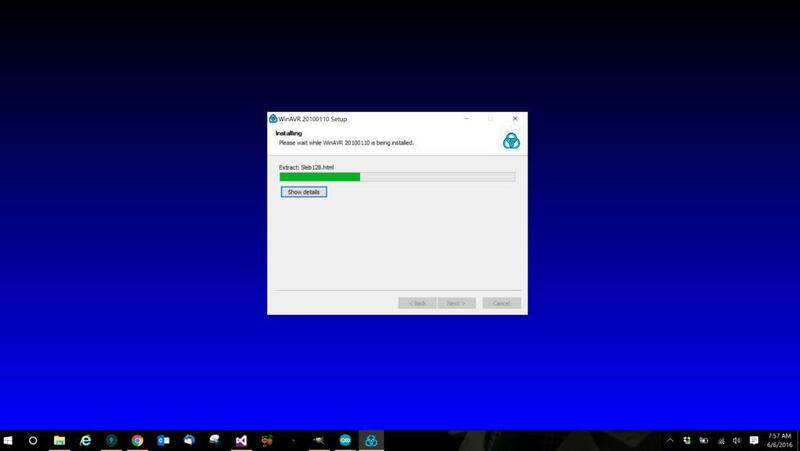 Download the Uploader Download my Lumi Uploader (Windows 10). It only costs a bazillion-million dollars; nah, it’s free. Eventually, I’ll probably re-write this app for Mac and iOS. But gotta get the bugs outta of the Windows version first. Connect UART IC to ATtiny85 Connect the UART IC to the ATtiny85 as shown. Time to upload the sketch! What happens if you click the “Reset” button? This should send the DTR line low, then high, essentially resetting the ATtiny85 Did you accidentally select the bootloader included version of your binary? Was the correct COM port selected? Often, windows will list Bluetooth bridges as COM ports, which can make it confusing. Did you try lower baud rates? The TSB uses software serial, which doesn’t work too well on higher baud rates. Did I make a mistake? If so, shoot me a line or leave a comment–I’ll do my best.